As a means of recording the passage of time, the 17th century was that century which lasted from 1601- 1700 in the Gregorian calendar. Shogun Tokugawa Ieyasu is the founder of Japan's last shogunate, which lasted well into the 19th century. 1601: Battle of Kinsale, one of the most important battles in Irish history, fought. 1602: Dutch East India Company founded. Its success contributes to the Dutch Golden Age. 1603: Elizabeth I of England dies and is succeeded by her cousin King James VI of Scotland, uniting the crowns of Scotland and England. 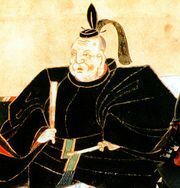 1603: Tokugawa Ieyasu seizes control of Japan and establishes the Tokugawa Shogunate which rules the country until 1868. 1603- 23: After modernizing his army, Abbas I expands Persia by capturing territory from the Ottomans and the Portuguese. 1605: Gunpowder Plot failed in England. 1607: The London Company establishes the Jamestown Settlement in North America precipitating the British colonization of the Americas. 1608: Quebec City founded by Samuel de Champlain in New France (present-day Canada). 1611: The King James Version of the Bible is completed. 1613: The Time of Troubles in Russia ends with the establishment of the House of Romanov which rules until 1917. 1615: The Mughal Empire grants extensive trading rights to the British East India Company. 1618- 48: The Thirty Years' War devastates Central Europe. 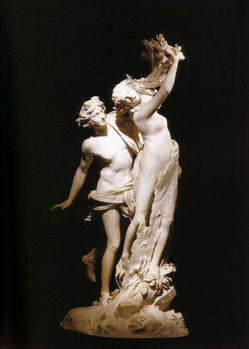 Apollo and Daphne ( 1622- 1625), by Gian Lorenzo Bernini is considered one the masterpieces of the century. 1624- 42: As chief minister, Cardinal Richelieu centralizes power in France. 1625: New Amsterdam founded by the Dutch West India Company in North America. 1637: The Dutch tulip mania bubble bursts. 1639- 51: Wars of the Three Kingdoms, civil wars throughout Scotland, Ireland, and England. 1640: Portugal regains its independence from Spain bringing an end to the Iberian Union. 1640: Torture is outlawed in England. 1641: The Tokugawa Shogunate institutes Sakoku- foreigners are expelled and no one is allowed to enter or leave Japan. 1642: Dutch explorer Abel Janszoon Tasman achieves the first recorded European sighting of New Zealand. 1644: The Manchu conquer China ending the Ming Dynasty. The subsequent Qing Dynasty rules until 1912. 1648: The Peace of Westphalia ends the Thirty Years' War and the Eighty Years' War and marks the ends of Spain and the Holy Roman Empire as major European powers. 1648- 53: Fronde civil war in France. 1648- 67: The Deluge wars leave Poland in ruins. 1648- 69: The Ottoman Empire captures Crete from the Venetians after the Siege of Candia. 1652: Cape Town founded by the Dutch East India Company in South Africa. 1655- 61: The Northern Wars cement Sweden's rise as a Great Power. 1660: The Commonwealth of England ends and the monarchy is brought back during the English Restoration. 1660: Royal Society of London for the Improvement of Natural Knowledge founded. 1661: The reign of the Kangxi Emperor of China begins. 1662: Koxinga captures Taiwan from the Dutch and founds the Kingdom of Tungning which rules until 1683. 1663: France takes full political and military control over its colonial possessions in New France. 1664: British troops capture New Amsterdam and rename it New York. 1665: Portugal defeats the Kongo Empire. 1666: The Great Fire of London. 1667- 99: The Great Turkish War halts the Ottoman Empire's expansion into Europe. 1670: The Hudson's Bay Company is founded in Canada. 1674: Maratha Empire founded in India by Shivaji. 1676: Russia and the Ottoman Empire commence the Russo-Turkish Wars. 1682: Peter the Great becomes joint ruler of Russia (sole tsar in 1696). 1682: La Salle explores the length of the Mississippi River and claims Louisiana for France. 1683: China conquers the Kingdom of Tungning and annexes Taiwan. 1685: Edict of Fontainebleau outlaws Protestantism in France. 1687: Isaac Newton publishes Philosophiae Naturalis Principia Mathematica. 1688- 89: After the Glorious Revolution, England becomes a constitutional monarchy and the Dutch Republic goes into decline. 1688- 97: The Grand Alliance sought to stop French expansion during the Nine Years War. 1689: Nerchinsk Treaty establishes a border between Russia and China. 1692: Salem witch trials in Massachusetts. 1700- 21: Russia supplants Sweden as the dominant Baltic power after the Great Northern War. Gustavus Adolphus, King of Sweden ( 1594- 1632). Francis Bacon, English philosopher and politician ( 1561- 1626). Sir Thomas Browne, English author, philosopher and scientist ( 1605- 1682). Charles I of England ( 1600 - 1649). Charles II of England ( 1630 - 1685). Richard Cromwell, Lord Protector of England, Scotland and Ireland ( 1626 - 1712). Elizabeth I of England ( 1533 - 1603). James I of England ( 1566 - 1625). James II of England ( 1633 - 1701). Mary II of England ( 1662 - 1694). Dubhaltach MacFhirbhisigh (d. 1671), Irish historian and genealogist. William III of England ( 1650 - 1702). Abel Janszoon Tasman ( 1603 - 1659), Dutch seafarer and explorer. Major changes in philosophy and science take place, often characterized as the Scientific revolution. Banknotes were reintroduced in Europe. Tea and coffee become popular in Europe. Central Banking in France and modern Finance by Scottish economist John Law. 1684: Calculus independently developed by both Gottfried Leibnitz and Sir Issac Newton and used to formulate classical mechanics.